Our semi dried tomatoes are a natural alternative to sun-dried versions with a burst of flavour that embodies their quality. Available in food service or retail sizes. 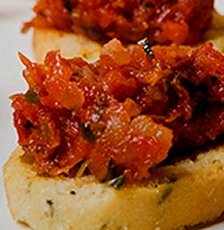 Semi-Dried tomato products cannot be purchased online due to the unavailability of economical and reliable refrigerated shipping service. Please contact if you are interested for food service or distribution. Our Semi Dried tomatoes have been smoked in a smoking chamber to produce a rich smoky taste of tomato flavour that enhances any dish. Available in food service or retail sizes. Use as appetisers, pasta, lunch filler, casseroles, pizza, sauces, salads and more.